With 7.5 billion people on earth, finding your long-lost doppelganger can be harder than finding a needle in a haystack. 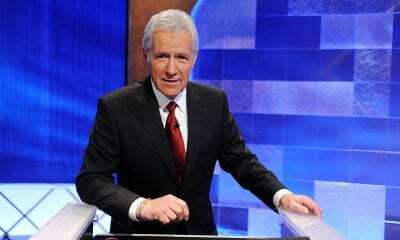 Yet for these celebrities, finding their doppelganger is easier than shooting fish in a barrel. 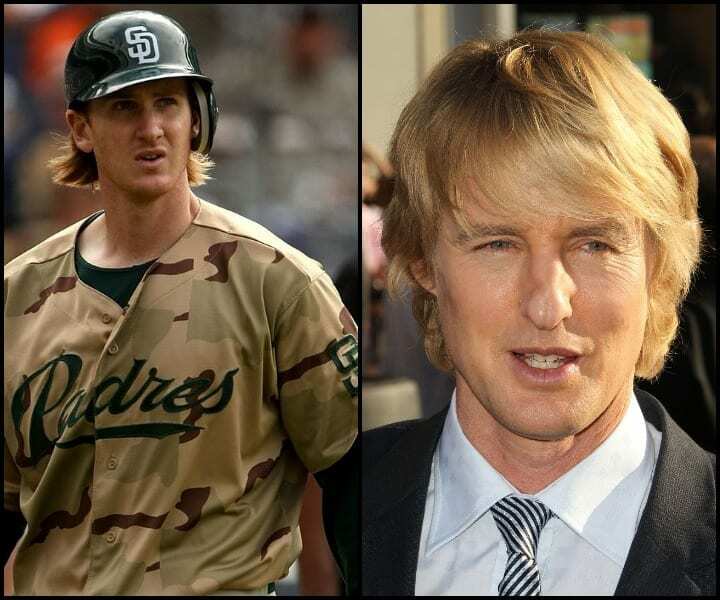 Thanks to hours of thorough research and facial analysis, TieBreaker has established the definitive list on athlete/celebrity look-alikes. 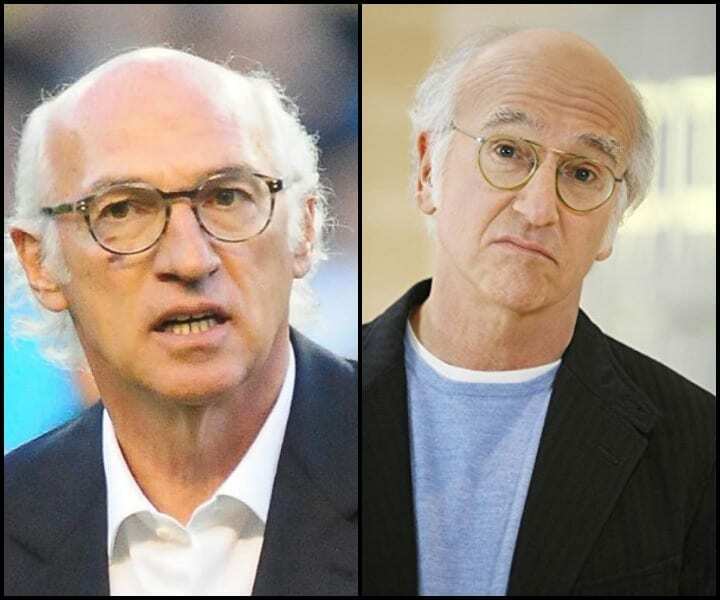 Carlos Bianchi, meet your identical twin, Larry David. These two balding, white-haired middle-aged doppelgangers look upset. What upset them, you may ask? Probably everything and anything under the sun. If you’ve seen “Curb Your Enthusiasm” you’d know how irritable and sensitive Larry David is. And if you were to connect a few dots, jump to a few conclusions, you could assume that the former head coach of Roma and Atletico Madrid, Carlos Bianchi, had a similar disposition. One cannot wear these circular glasses and have that haircut and not be frustrated about something. It’s impossible. Bianchi most recently coached the Boca Juniors while David remains a semi-relevant Hollywood personality. Snooooooooop! The D O Double G is one of the LBC’s greatest rappers and has been a mainstay on a radio for decades. Chris Bosh, before health problems cut his career short, was a mainstay on television. These two are a powerful duo who have succeeded on the biggest stages. Bosh is a two-time NBA champion and 11-time All-Star. 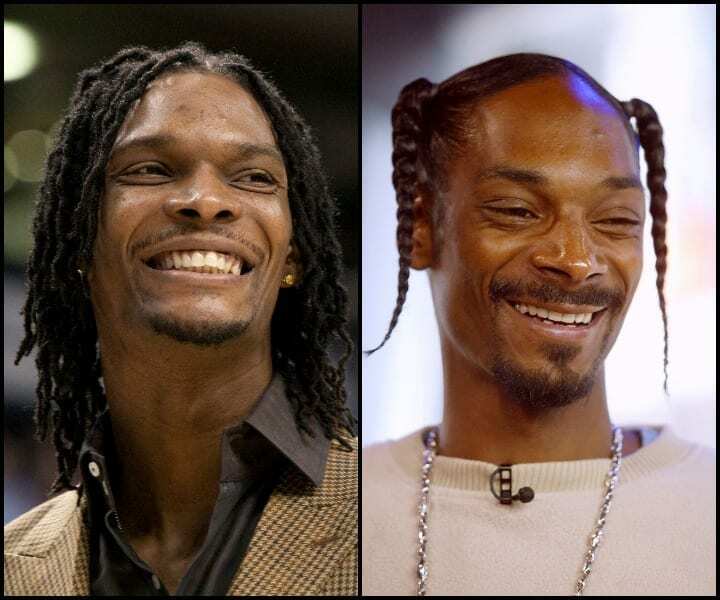 Snoop Dogg, who loves sports but isn’t too good at them, is one of the more iconic rappers the world has ever been fortunate enough to listen to. Hopefully, these two can one day link up and collaborate on a hip hop infused basketball movie…because that hasn’t been done before. Well, aren’t these two a dandy pairing. 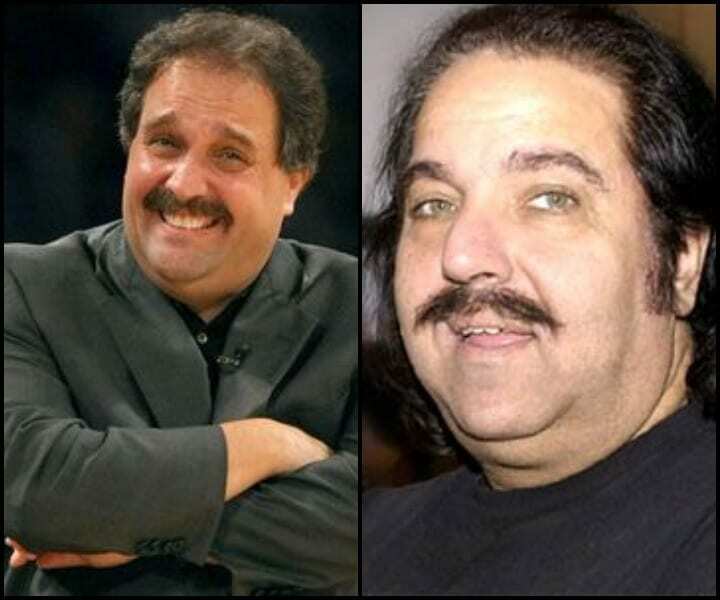 On the left, we have one of the most obnoxious basketball coaches in history, Stan Van Gundy. Stan, along with his horribly irritating brother Jeff, has been given countless chances to prove himself as a competent head coach and each time he has failed. When will the NBA world realize it needs to avoid the Van Gundys like the plague? On the right, we have legendary adult film star Ron Jeremy. Jeremy, like Van Gundy, has been around the game forever, except the big difference (emphasis on big) is he’s one of the more accomplished figures in his field. 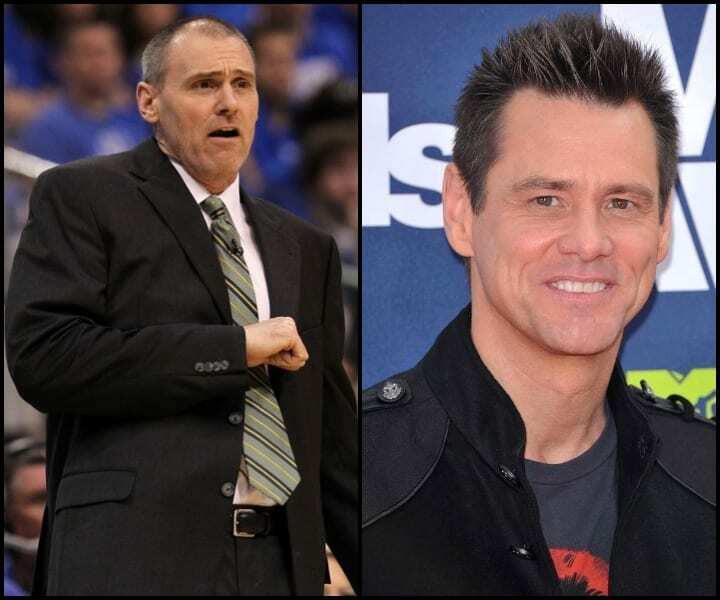 NBA coach Rick Carlisle is doing his very best Jim Carrey impersonation here. He’s really bringing out his inner “Cable Guy” face with this one. Carlisle has two NBA championships under his belt, one as a player with the Celtics and one as a coach with the Mavericks. He’s also an avid pilot and has a logged many hours in the sky. Jim Carrey, an actor who appears to have his head in the clouds, too, is famous for starring in films such as “Ace Ventura: Pet Detective” and “Dumb and Dumber.” Carrey, born in Canada, became a U.S. Citizen in 2004. These two look like twins separated at birth who then magically reconnected pledging the same fraternity. When they reconnected, the long-lost brothers rapidly divulged how successful each one of them had become in two very different industries. “Bro! You are a sick actor!” Roddick would exclaim. “Thanks, dude! And your tennis skills are killer!” William Scott would reply. 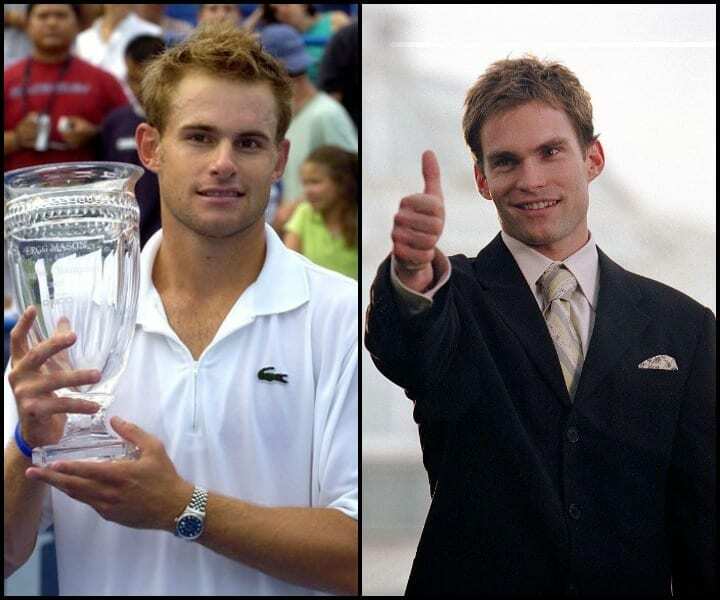 Andy Roddick, for all of the hype he received, only won one Grand Slam. And Seann William Scott, similarly, didn’t have the most impressive career. The bulk of his fame came from the “American Pie” movie series where he starred as Steve Stifler, the loveable meathead. Corey Maggette is determined to pimp his game to the next level. The former 13th-overall pick is out of the NBA and in the BIG3, a three-on-three basketball league where former stars come together to relive their glory days and battle it out for the championship. 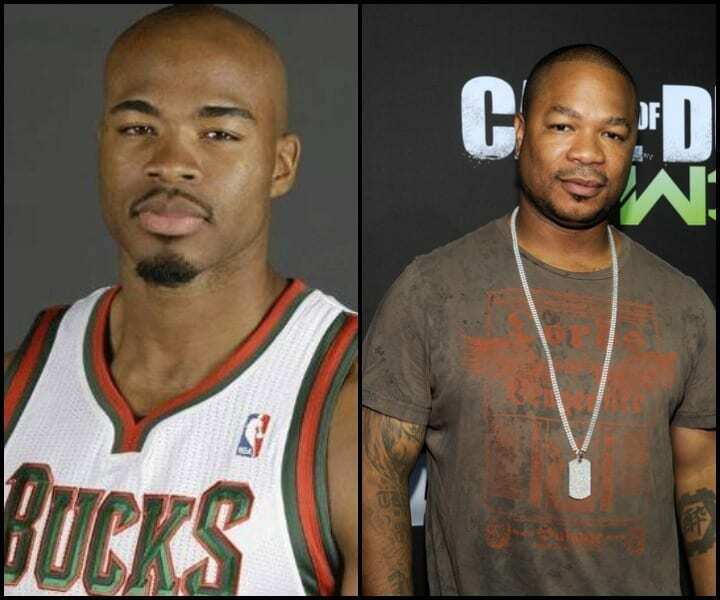 Opposite Maggette is Xzibit, the rapper and famed host of the comically bad MTV show “Pimp My Ride.” Xzibit was the man that would put fish tanks in trunks and Play Stations in the backseat. He would take your horrible ’98 Honda Civic and give it cool features that you would never use or find applicable but the fact that your Civic was featured on MTV made it all worthwhile. 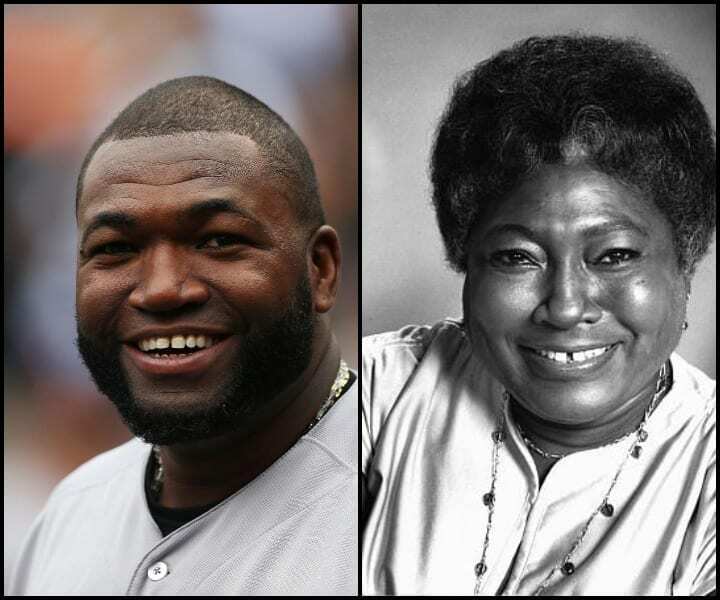 Have either David Ortiz grow out his hair or have Esther Rolle get a buzz cut. That’s all it will take for these two icons to become doppelgangers. It’s not often that people of different genders make a doppelganger list but Ortiz and Rolle easily pull it off. 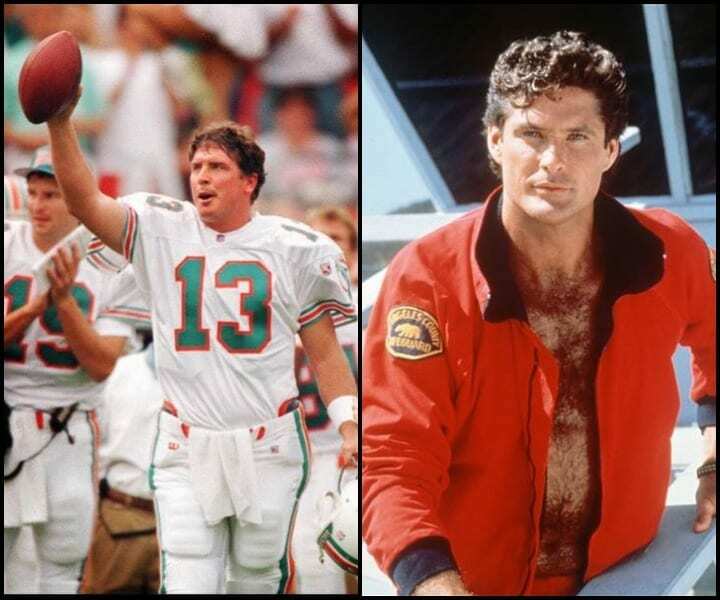 One of the greatest quarterbacks to never win a Super Bowl, “Dolphin” Dan Marino was a Pittsburgh legend before going pro. In the NFL, Marino was the most prolific quarterback in an era not dominated, like today, by passing. He was the Peyton Manning before Peyton Manning. Sadly for Marino and the Dolphins, they were never able to win the big game. On the right, we have David Hasselhoff, a man who is notorious for talking a big game. As the male star on the hit series “Baywatch,” Hasselhoff’s life revolved around talking shop and saving drowning victims who underestimated the power of the Pacific Ocean. 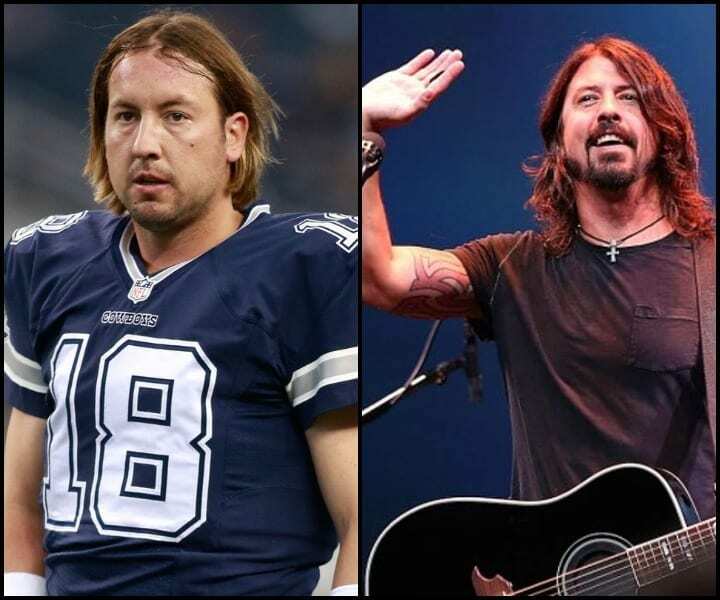 It’s tough having to associate a rock legend with such a pathetic quarterback but there’s simply no denying how similar Dave Grohl, the lead singer of the Foo Fighters, looks to Kyle Orton, the neck-beard-wearing quarterback. Orton, pictured here without his signature beard, gained his fame through his looks, not his abilities. His neck beard was the stuff of legends. His passing, not so much. At one point, Orton was the NFL’s highest-paid backup. After leading the Bills to a 9-7 season in 2014, Orton retired without informing teammates or coaches. Unlike Orton, Grohl is considered to be the best in the business and one of the world’s greatest drummers. Nick Foles rose to fame as the Philadelphia Eagles’ backup quarterback who guided the franchise to their first Super Bowl victory during a thrilling upset over the New England Patriots. That game made Nick a legend and helped spin off many great nicknames, all of which are too inappropriate to list here. 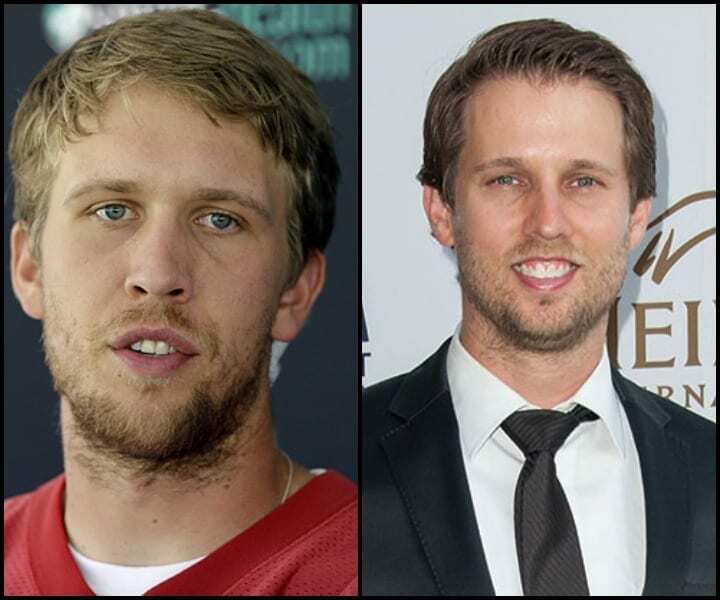 Other than that improbable Super Bowl run, Foles’ career hasn’t been too exciting or notable, something Jon Heder knows all about first hand. Heder, who starred as Napoleon Dynamite in the eponymous film, has since been largely irrelevant, failing to live up to the success he found during that breakout performance. 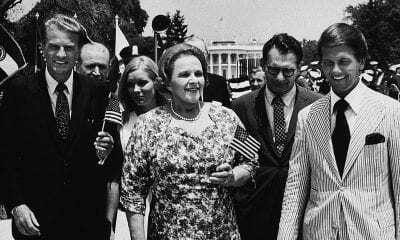 While Washburn was winning a World Series, Sutherland was winning the hearts of the American people with his heroic efforts to save the country from global terrorism. 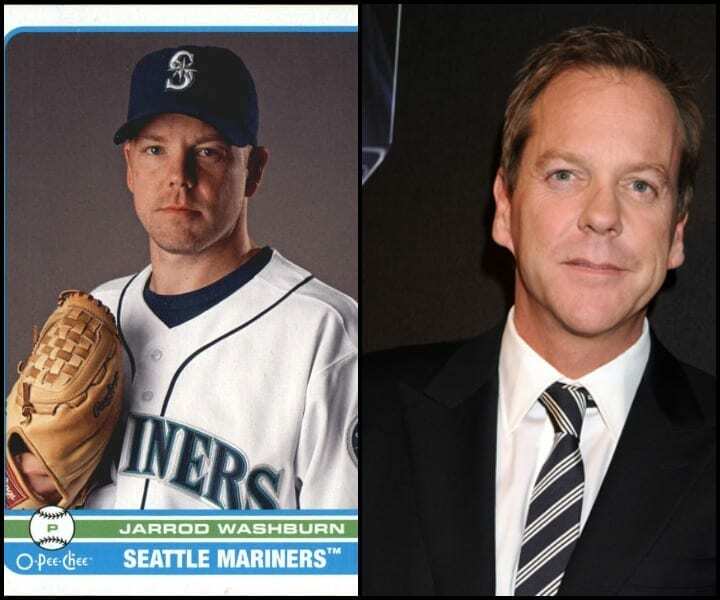 Today, Washburn is a high school baseball coach and Sutherland, who changed positions and swapped his guns for a guitar, is the lead singer in a country band. 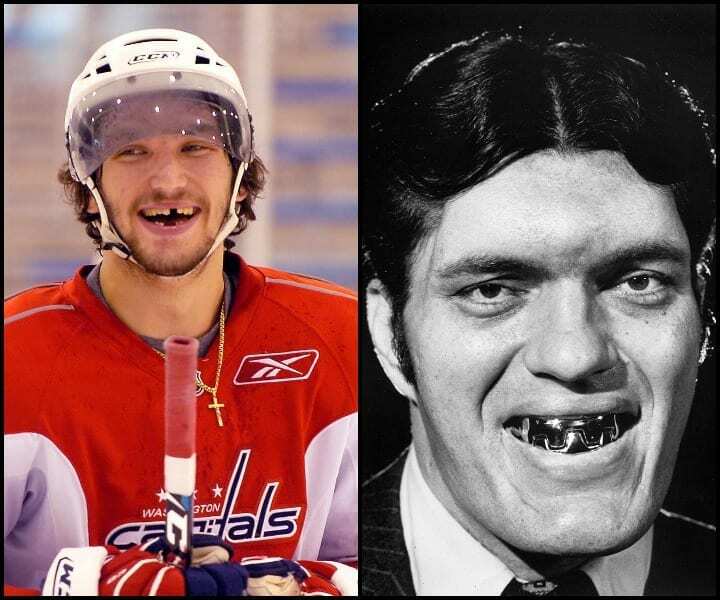 Hockey players are notorious for their missing their teeth, and Russian All-Star Alexander Ovechkin, aka “Big Red,” is no exception. In 2018, Ovechkin, one of the NHL’s most formidable players and a three-time Hart Memorial Trophy (MVP) winner, won his first Stanley Cup. He finally got the championship-drought monkey off his back. Had the monkey had sharp metal grills, like Richard Kiel in James Bond, Ovechkin would probably still be without a championship. The 7-foot Kiel is most notable for his role as Jaws in “James Bond.” He also appeared in Adam Sandler’s “Happy Gilmore.” In 2014, Kiel passed away in California. The resemblance is uncanny. Phil Mickelson, nicknamed Lefty, has been in Tiger Woods’ shadow for virtually his entire career. It’s a frustrating place that has defined his career almost as much as the five Majors he’s won. However, underachieving hasn’t been able to erase the positive mindset and ear-to-ear smile Mickelson (or his caddy) carries with him everywhere. 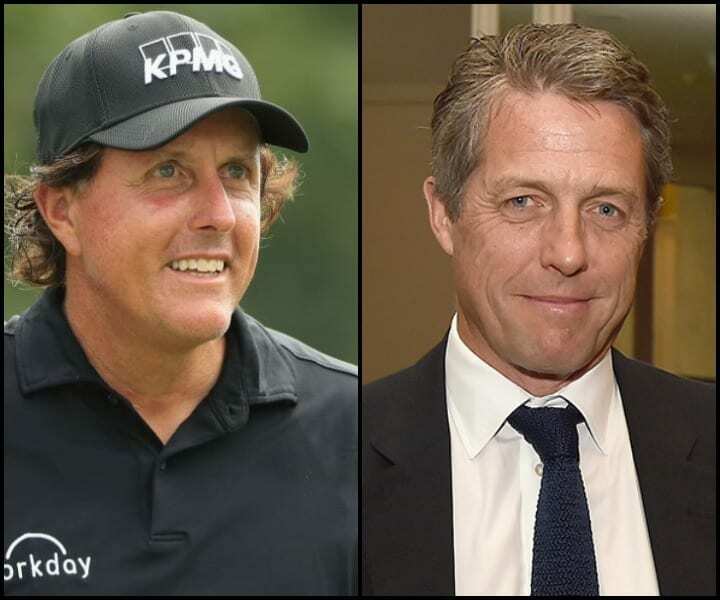 Phil’s doppelganger is Hugh Grant, a British actor known for his cheesy lines, predictable gestures, and propensity for appearing in romcoms. Grant, also accompanied by a smug smile wherever he goes, has a checkered past and a passionate disdain for the media. From the neck up, these two look nearly identical. Of course, those similarities would disappear if these two stars took off their shirts. 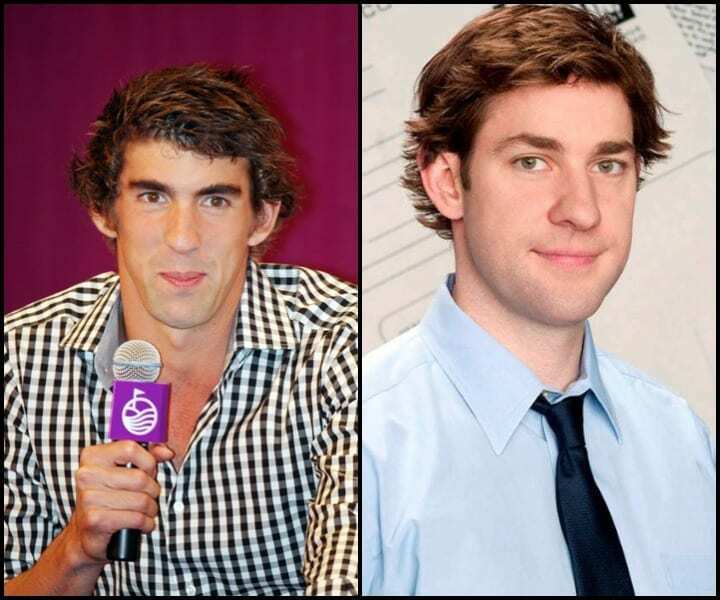 That’s because Michael Phelps, on the left, is the closest thing this world has seen to a god. The “Flying Fish,” Michael Phelps is the most successful Olympian in history. He has 23 gold medals (28 overall) and a body sculpted by Michelangelo. Krasinski, who rose to fame for his role in the critically acclaimed TV series “The Office,” is more partial to the dad bod, which is fitting seeing how he has two daughters with actress Emily Blunt. 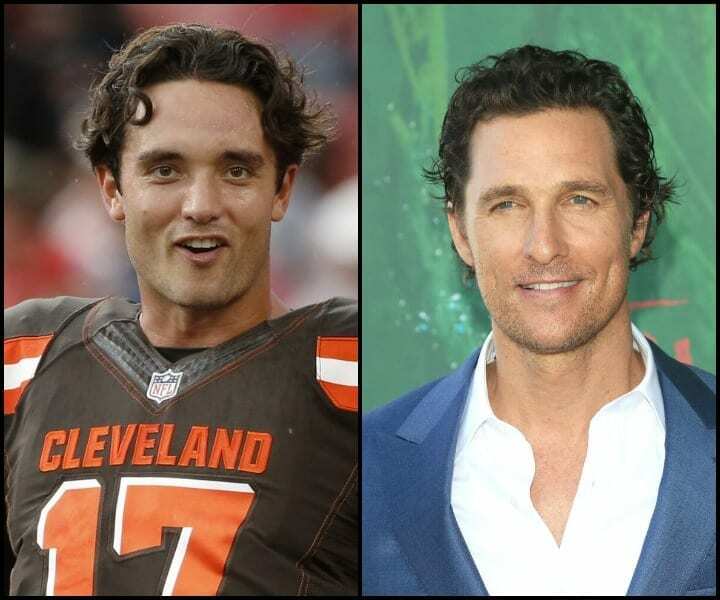 The similarities between Brock Osweiler and Matthew McConaughey start and stop with their looks. They both have the same style of hair and similar face shape. They both have that cocky grin. Except McConaughey has earned the right to wear that crooked smile. He’s a legend. Alright, alright, alright, we get it. The man is a certified Hollywood star. Meanwhile, Brock Osweiler hasn’t done much in the NFL except frustrate fans and steal money from multiple franchises. While McConaughey stars in Oscar-winning films and horribly pretentious Lincoln ads, Osweiler occupies a precious spot on the bench, clutching a backup’s favorite item, the clipboard. The NHL’s second-best Russian-born player is Evgeni Malkin, the right-hand man to Sidney Crosby. Malkin can do it all on the ice, from scoring goals to defense and everything in between. He’s even got that dreamy gaze that Nick Jonas is working so hard to achieve. 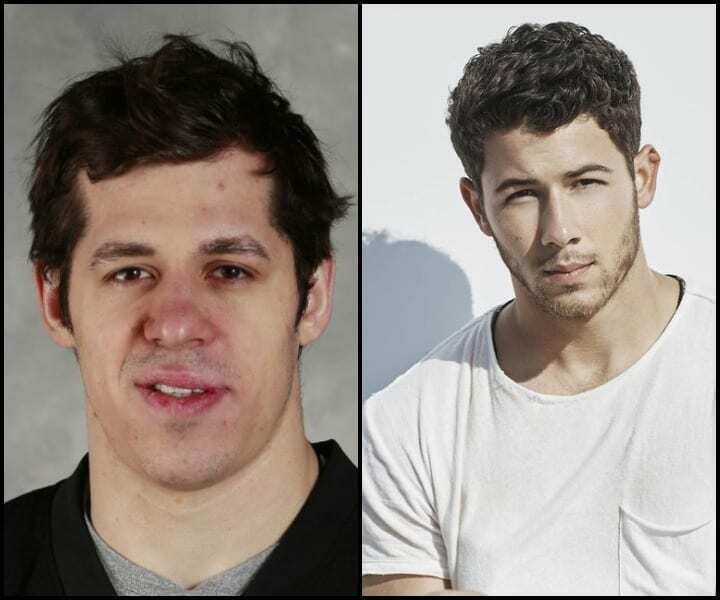 But alas, Malkin’s stare is a bit different. His is the byproduct of playing one of the most physical games on earth and taking one too many pucks to the head. Jonas, who recently married actress Priyanka Chopra, is probably modeling a new line of edgy, semi-ripped t-shirts that cost way too much money. Twins! Sharp-shooter Kyle Korver and Ashton Kutcher are made for lists like this. The twins took separate paths in high school but maintained the same style. Korver, who was born with more athletic genes, dedicated his days to shooting threes. He was going to reach the NBA on his shot and nothing else and he was totally fine with that. Meanwhile, Kutcher, who was always more dramatic as a kid, went the theater route, spending his nights on stage in front of tens of local parents. 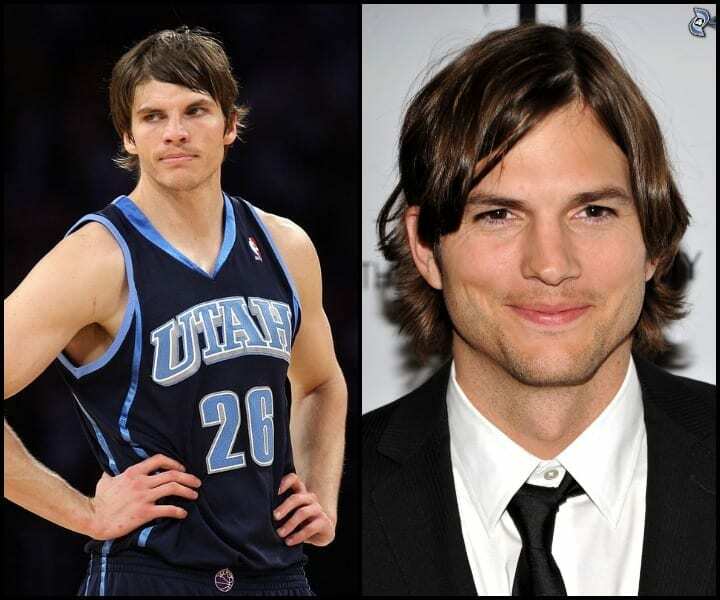 Eventually, the hard work paid off for the two, with Korver being drafted in the second round and Kutcher becoming one of Hollywood’s most recognizable faces. Where are they looking? Khalil Greene appears to be looking into the crowd, trying to find the person who stole his career. After coming into the league looking like one of the most promising young stars, Greene fizzled out and slowly became irrelevant. Wilson also appears to be gazing into the crowd, but he isn’t looking for the person who stole his career, because he still has one. Wilson is actually looking for the person who elbowed him in the nose during a pickup basketball game back in the ’90s, causing his nose to look more crooked than a question mark. 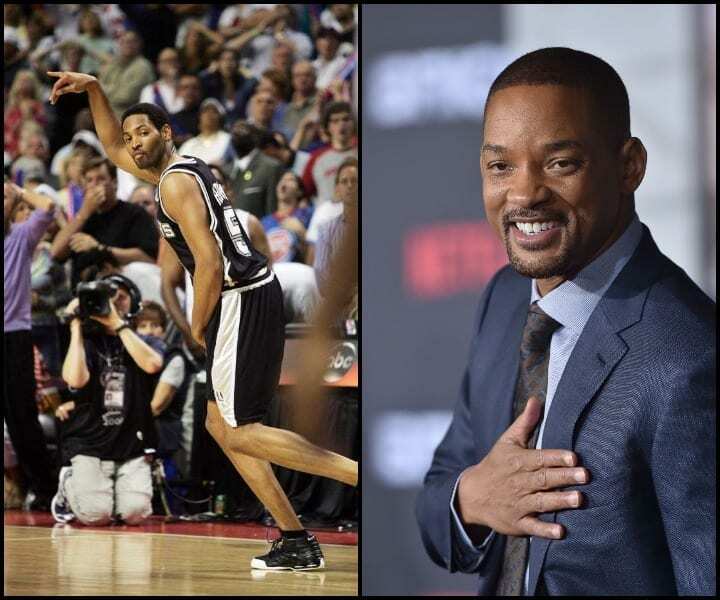 It looks like Will Smith is pledging allegiance to the swish. “Big Shot Rob” was one of the most clutch shooters in NBA history. He’s won seven NBA Finals and is responsible for sending the city of Sacramento into a deep depression after hitting a clutch buzzer-beater back in the 2002 Western Conference Finals. Horry also has the good fortune of being traded to or signing with teams on the cusp of becoming dynasties, like the Lakers and Spurs. Smith, who has a pretty sweet stroke himself, is regarded as one of the most successful and marketable actors in the world and has won two Oscars and four Grammy Awards. Jon Gruden is a psychopath. Some people think he’s an offensive guru, others think he’s actually a horrible coach who got really lucky. But one thing everyone can agree on is how obnoxious Gruden is. Thankfully, the Raiders are equally dumb as Gruden is obnoxious and decided to hire him as their head coach. That move hasn’t panned out well at all, but it did spare millions of Americans from being forced to listen to him on Monday nights. Thank you, Oakland (soon to be Vegas)! 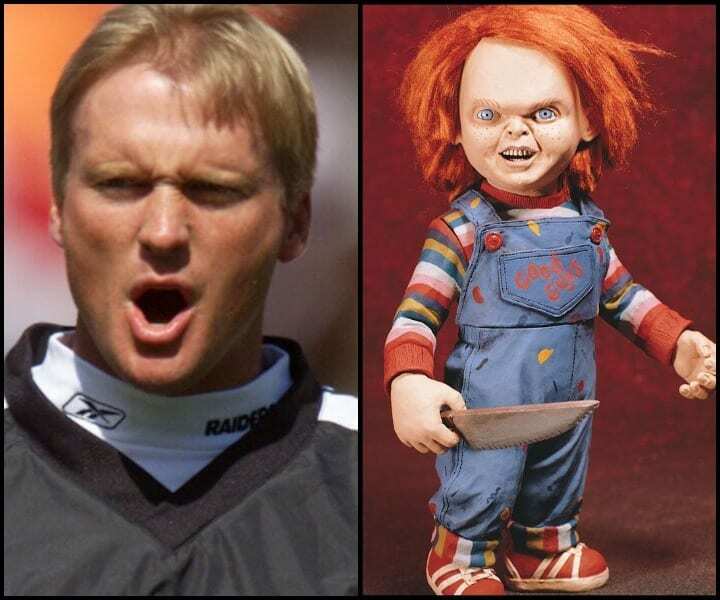 Next to Gruden is Chucky, an equally horrifying character but for vastly different reasons. The greatest hockey player since Wayne Gretzky is Sidney “Sid the Kid” Crosby. He’s a Stanley Cup champion and Olympic gold medalist. Crosby has set numerous Penguins and NHL records while setting the new standard for offensive production. He’s a generational talent who can also be credited with helping boost the NHL’s popularity. 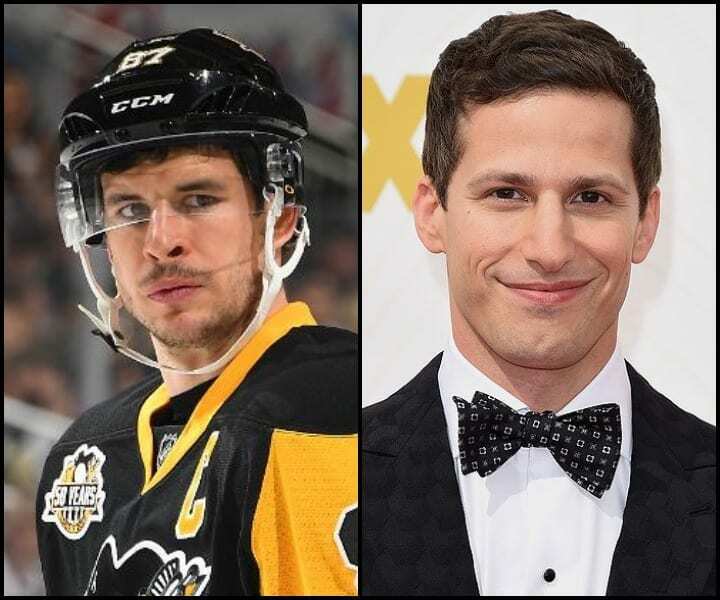 Crosby, to say the least, takes his job very seriously, unlike his celebrity look-alike Andy Samberg. Samberg hasn’t set any Hollywood records or redefined the industry. He’s far from the greatest of all time but he is a very funny guy who had a small stretch of glory during his SNL days. Which one became irrelevant faster? Which star burned up first? On one hand, we have former Saints quarterback Aaron Brooks. A fourth-round pick, Brooks definitely lived up to the expectations of a quarterback drafted in the fourth round. He was, at his absolute best, just average. Some days he would provide Saints fans with a glimmer of hope, and others he would crush their souls with bad decisions and worse throws. Brooks retired in 2007. 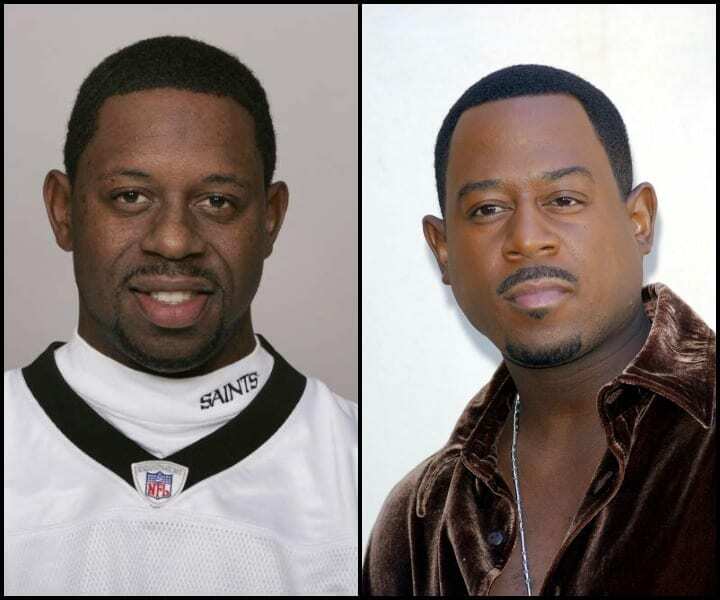 Lawrence hasn’t officially retired from Hollywood but he’s been a shell of his former “Bad Boys” self. If you haven’t already seen Lawrence’s “Wild Hogs,” with its 14 percent rating on Rotten Tomatoes, be sure to check it out. There couldn’t be a more natural pairing. 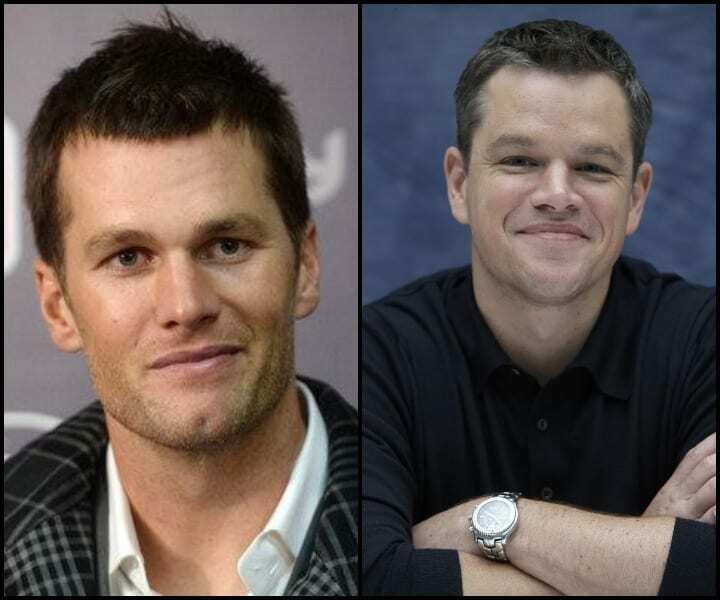 Tom Brady, a New England hero, matched up with Boston’s favorite locally sourced actor, Matt Damon. The fact that the two are good acquaintances makes it even better. Brady is the greatest quarterback ever. Anyone who argues that is a dense hater. Damon may not be the greatest actor of all time but he is a homegrown hero who can put on a gnarly Boston accent when his character requires it, which is in nearly every movie. The two friends are also some of the more charitable celebrities in America, so as much as you may hate Brady on the field, it’s hard to not love him off it. Most of you probably don’t know who Jim Kleinsasser is and that’s ok. The pride of Carrington, North Dakota, Kleinsasser spent his entire career with the Minnesota Vikings blocking for Adrian Peterson. 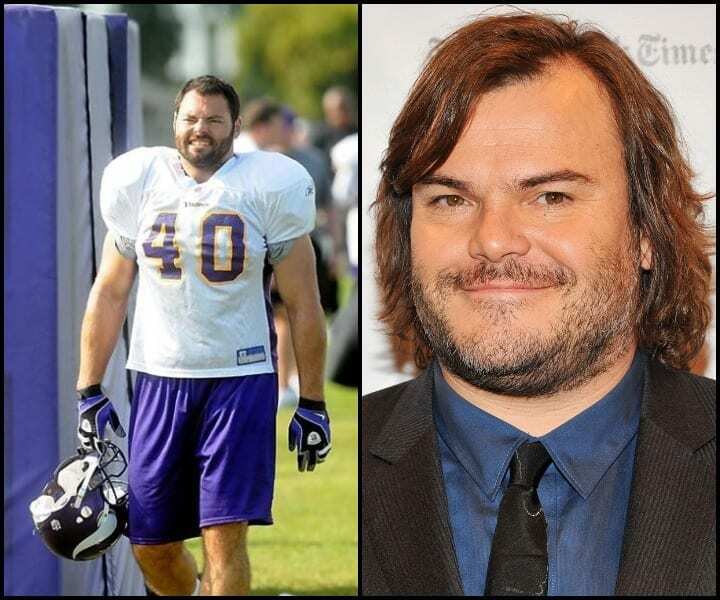 Kleinsasser was a fullback and tight end who could and would do it all, just like his pal and doppelganger Jack Black. Black, who managed to find the spotlight that eludes virtually every fullback, has starred in a variety of distinct roles, such as Dewey Finn in “School of Rock” and Jeff Portnoy in “Tropic Thunder.” Black also performs in his rock band Tenacious D alongside his good friend Kyle Gass. As the Head Coach at the University of Arizona, Sean Miller has led coached a plethora of talent, including No. 1 overall pick in the 2018 NBA Draft, Deandre Ayton. He’s also won four Coach of the Year awards in multiple conferences, including one in the Atlantic 10 Conference and three in the Pac-12. At just 50, Miller is one of the most successful coaches in the NCAA and is a staple in the NCAA Tournament. 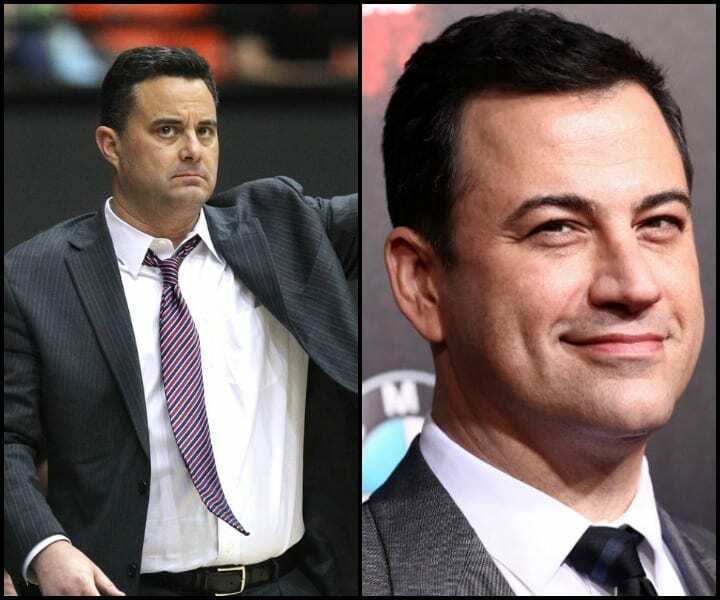 Opposite of Sean Miller lies Jimmy Kimmel, who like Miller, is a staple on television screens nationwide. Kimmel is the host of “Jimmy Kimmel Live,” one of America’s most viewed programs. Kent Graham is but a bleep on the NFL’s radar, a small, obscure, and unknown star in a bloated galaxy. He was an Ohio State product who spent much of his career as a backup, throwing for a total of 39 touchdowns and 33 interceptions. Opposite the subpar quarterback is subpar actor Ted Danson. 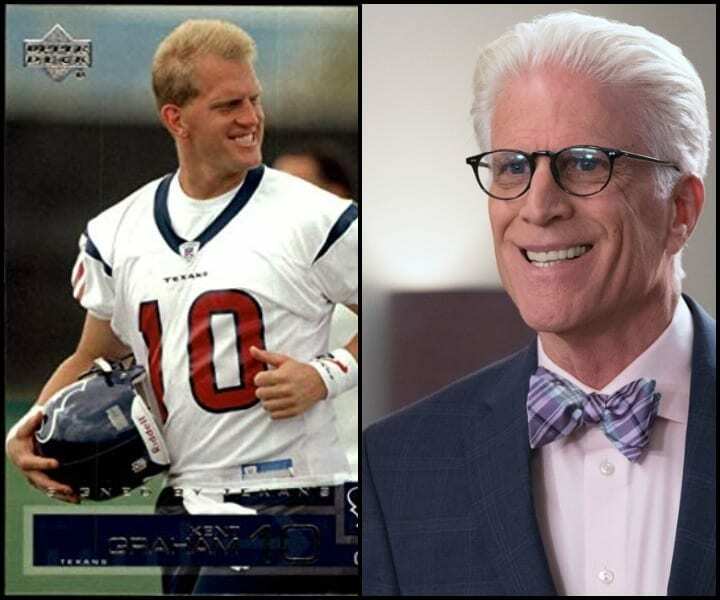 Danson is generally recognized as Sam Malone from the sitcom “Cheers.” Danson, primarily a television actor, also guest starred on Larry David’s “Curb Your Enthusiasm.” Together, these two have a combined StarPower Score of 3, one of the lowest rankings on this list. Step up your game, Ted. 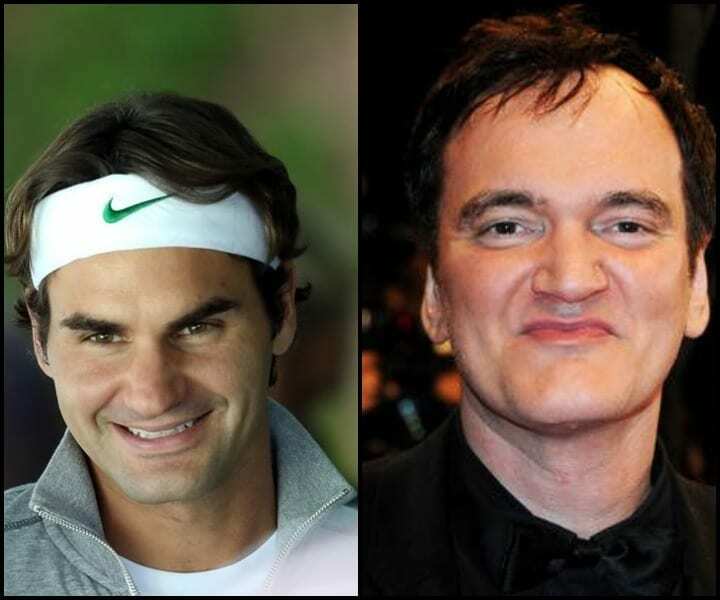 If Roger Federer wasn’t wearing the thickest sweatband in the history of sports, compliments of Nike, he’d look even more similar to famed movie director Quentin Tarantino. Federer has long been considered the best male tennis player in the world and he backs up that claim with 20 Grand Slam championships, the most in history for a male player. Similarly, Tarantino is also widely considered to be one of the best in his respective industry. With two Academy Awards and numerous other personal accolades, many film aficionados consider Tarantino one of the most unique and accomplished directors in Hollywood history. The point guard and the drummer boy. These two international icons have a lot in common, highlighted by their long hair, facial hair, and knack for creativity. Rubio shows off his creative mindset on the court with flashy passes and fancy handles, while Starr, at a moment’s notice, can dive into a crazy drum solo that will send all the Beatles scurrying. 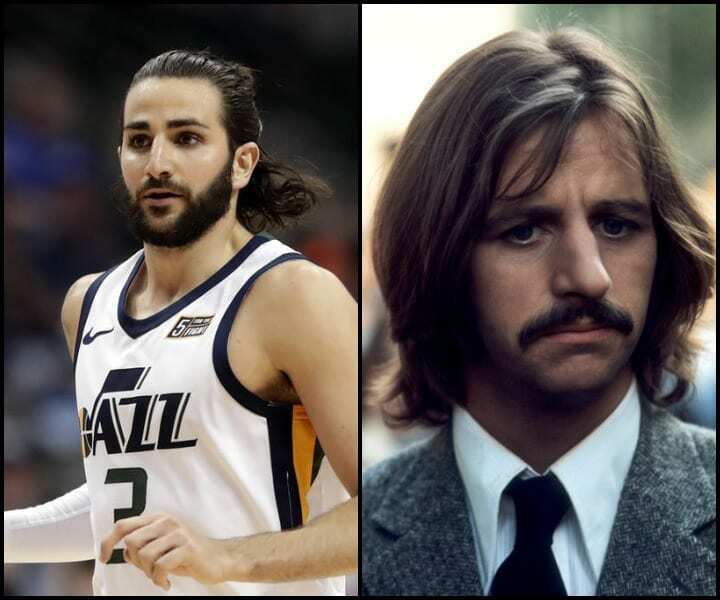 Ricky Rubio was pegged to be the point guard of the future, a European sensation who could redefine the game of basketball. He’s hardly lived up to the hype. Starr, conversely, was the iconic drummer for the world’s most recognizable band. Kerry Wood was supposed to be baseball’s next big thing but 14 stops on the disabled list in 14 seasons hampered his production and stunted his greatness. In 1998, Wood was the NL Rookie of the Year and appeared in two All-Star games. 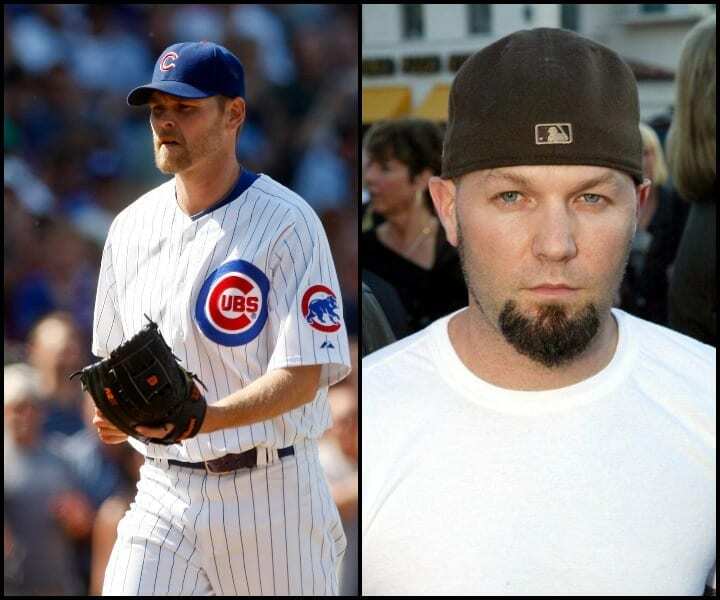 On the other side of the picture, we have Fred Durst, the frontman for the rap-rock band Limp Bizkit. NHL and Olympic gold medalist Roberto Luongo is a force in the net. He’s been one of the NHL’s most consistent goalies in recent memory and has helped Team Canada, much to the chagrin of Team USA fans, dominate at the Olympic level. 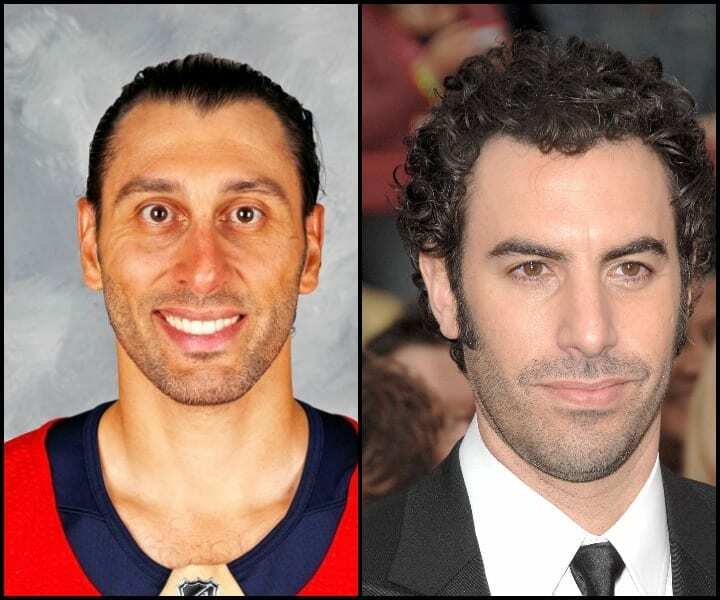 Opposite Luongo is another global icon, Sacha Baron Cohen.